Carnation Milk 1943 Ad. 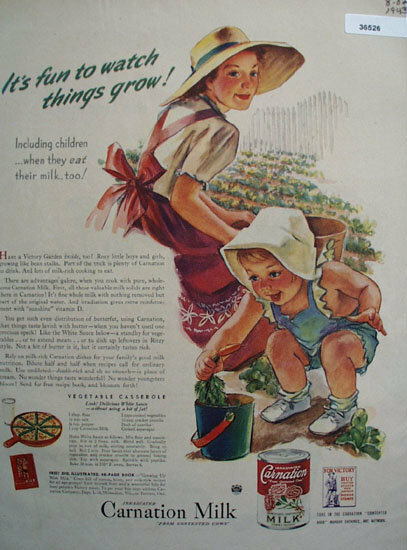 This color August 2, 1943 ad states its fun to watch things grow, including children, when they eat their milk, too. A recipe for Vegetable Casserole on ad. Picture shows woman with hat on and small girl working in garden. Little girl is looking at carrot in bucket. Magazine tear sheet picture is taken through plastic and may show wrinkles or crookedness that is not in the ad. This Original magazine tear sheet measures 10 1/4 inches wide by 14 inches tall. Items Similar To "Carnation Milk 1943 Ad."